The Compact Hydro Division is the world leader in products and services for small and medium-sized hydroelectric power plants and offers also competitive solutions for mini hydro power plants. Small-scale hydro power plants range up to an unit output of 15 MW for Axial and Kaplan turbines and an output of 30 MW for Francis and Pelton turbines while the mini compact hydro installations include Kaplan and Axial units (20 kW - 1,500 kW), Francis units up to 3,000 kW as well as Pelton units up to 5,000 kW. Compact Hydro stands for “water to wire” solutions based on pre-designed modular components and offers a single source of supply for the entire electromechanical equipment, as well as workshop-tested units, reduced dimensions for transportation and short installation times. For Mini Compact Hydro the level of standardization and parametrization was deeper expanded, keeping the same level of performances and quality, for lower investment costs and simplifying operation and maintenance of small hydropower plants. All guarantees concerning efficiency, output and resistance to cavitations are backed up by model tests in the ANDRITZ HYDRO laboratories for three to six bladed runners, double or single regulated, horizontal or vertical axis. The axial flow turbines are based on a modular design concept with the same key components used for different turbine types. The features of the Francis turbines ensure a wide application field according to specific needs. Guarantees of efficiency, output and resistance to cavitation for single and double discharge runners are based on model tests from the ANDRITZ HYDRO laboratories. 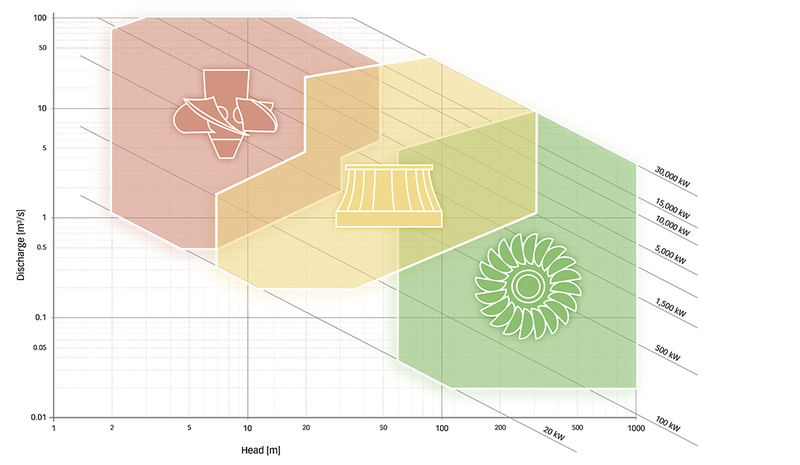 Francis turbines propose the highest efficiency. As far as the standard concept is applicable, the runner is directly fitted on the generator shaft, which ensures a compact construction and low maintenance. For smaller units the turbine-generator aggregate is delivered as a complete assembly package ready for immediate installation. Guarantees of efficiency and output are based on model tests from the ANDRITZ HYDRO laboratories for one to three nozzles in horizontal and three to six nozzles in vertical arrangement. The flow control of the Pelton turbine, via operation of nozzles and deflectors, provides a high efficiency along the flow range of operation as well as limited overpressure effect over the penstock. Over the years, the Compact Hydro Division has also developed a strong expertise in special applications for hydraulic turbines, like the energy recovery in Reverse Osmosis desalination process or in the drinking and waste water systems. To meet the requirements of the market in conjunction with the Compact Hydro turbines, an overall concept has been implemented which comprises both the mechanical and electrical equipment of the powerhouse. This means that the Compact Hydro division is in a position to tender both the hydro-mechanical equipment, as well as the total or partial electrical equipment up to a unit output of 30 MW. Order for two six nozzle, vertical shaft Pelton turbines with an output of 28 MW. Delivery of two 11.75 MW vertical Francis turbines and electro-mechanical equipment.